Major Indian famines were caused by droughts and poor food distribution policies. Though uneven rainfall was a major cause of Indian famines in the 19th century, faulty administrative and economic policies were equally responsible. The railway system was good at taking food out of agricultural regions but not utilized effectively for bring it back when crops failed. 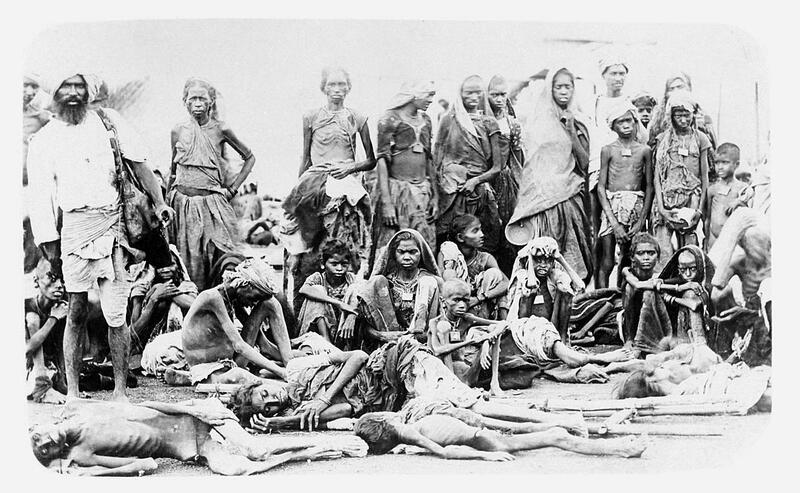 In his monumental book, Late Victorian Holocausts (Verso, 2001), the first part of which discusses the famines in India, Mike Davis estimates that some 12-30 million Indians died in the two major famines of 1876-79 and 1896-1902. He writes: "The great famines are the missing pages the absent defining moments, if you prefer – in virtually every overview of the Victorian era. Yet there are compelling, even urgent, reasons for revisiting this history. "At issue is not simply that tens of millions of poor rural people died appallingly, but that they died in a manner, and for reasons, that contradict much of the conventional understanding of the economic history of the nineteenth century. For example, how do we explain the fact that in the very half-century when peacetime famine permanently disappeared from Western Europe, it increased so devastatingly throughout much of the colonial world? Equally how do we weigh smug claims about the life-saving benefits of steam transportation and modern grain markets when so many millions,, especially in British India, died alongside railroad tracks or on the steps of grain depots?" (pp. 8-9).